경주시 황남동 미추왕릉 지구에 있는 신라 무덤인 황남대총은 2개의 봉분이 남·북으로 표주박 모양으로 붙어 있다. 그 중 북쪽 무덤에서 발견된 금 팔찌와 반지이다. 황남대총 북분 금팔찌 및 금반지(皇南大塚北墳 金製釧 및 金製指環)중 팔찌는 지름 7.5㎝ 내외로, 북쪽 무덤 덧널(목곽) 안에서 몸에 착용한 채 오른쪽에 5개 왼쪽에 6개가 발견되었다. 좌·우 5개는 금막대기를 구부려서 만들어 장식이 없는 간단한 모양이다. 왼쪽 팔에 있던 1개는 길다란 금판을 동그랗게 말고, 그 위에 금판을 덧 대어 세공하여 남색과 청색의 옥으로 화사하게 꾸몄다. 반지의 지름 1.8㎝로 모두 19개가 널(관) 안에서 발견되었는데, 그 가운데 오른쪽에 5개 왼쪽에 6개는 손에 낀 채로 발견되었다. 두 가지 문양이 보이는데 하나는 가운데가 마름모꼴로 된 것이고, 다른것은 중앙에 격자문을 새겨 넣은 것으로, 그 당시의 장식품의 외래적 문양이 사용된 것을 볼 수 있는 귀중한 자료이다. 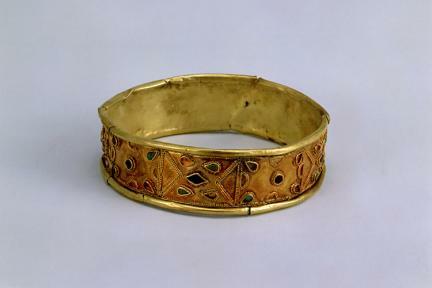 A gold bracelet with a diameter of approximately 7.5 cm and gold earrings with a diameter of 1.8 cm were discovered on the bodies buried in a wood coffin in the north tumulus of the Hwangnamdaechong Tomb. Five bracelets were found on the right arm, six on the left. 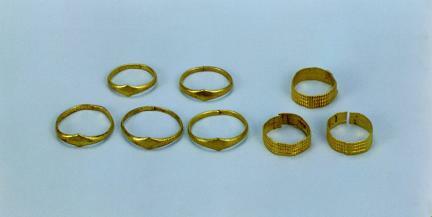 Five bracelets from each side were made simply by bending a gold stick, and have no decoration. One bracelet worn on the left arm was made by rolling up a long gold plate and attaching another gold plate over it. This gold plate has metal work on it and it is splendidly decorated with dark blue and green jade. A total of 19 rings were found in the coffin. Five were worn on the right hand, six on the left. Two patterns can be seen on the rings: one has a diamond shape in the middle, the other has a lattice engraving in the middle. Hwangnamdaechong, or the Great Tumulus of Hwangnam, is a Silla tumulus of located in Hwangnam-dong, Gyeongju, Gyeongsangbuk-do. The Gyeongju Tumuli serial number is Hwangnam-dong tumulus no 98. It was excavated and researched by the Office of Cultural Assets in 1973. Today the outward form of the tumulus has been restored. Two mounds connecting north and south give it the shape of a small gourd. It is the largest mound from the Silla Period.